Malta Maritime Directory :: Terracina Is Crucial For Team Chaudron Aspirations! Comment about: Terracina Is Crucial For Team Chaudron Aspirations! Terracina Is Crucial For Team Chaudron Aspirations! 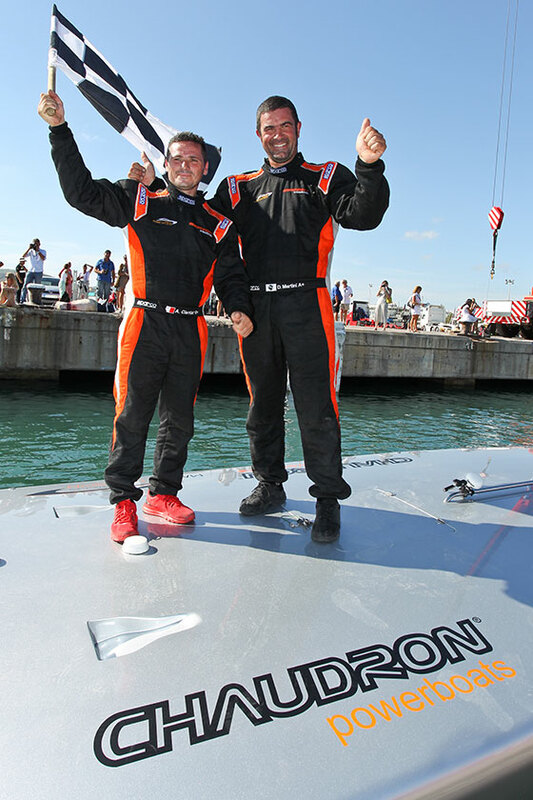 Ibiza gave Team Chaudron �The Mediterranean Grand Prix� - a proud moment to celebrate for Maltese driver Aaron Ciantar and French throttle-man Dominique Martini. It Takes Two - a most famous phrase with so many connotations related to notorious songs, films and television series. On this occasion the association is to a foremost Event, namely the forthcoming 2014 UIM ClassOne World Powerboat Championship appointment, the second in a three Championship programme, to be held at Terracina Italy between the 17th and 19th October. A determining appointment for all fourteen teams contesting this year's Worlds being organised by H2O Racing under the auspices of the Union Internationale Motonautique (UIM). The revised World Championship events format ‘ClassOne' see seven boats in the Class 1 Catamarans and another seven boats in the V1 Monohulls running together on a simple mirror-image circuit with separate sets of turn-buoys, Class 1 turning on the outside marks, V1 on the inside. On the first outing of the 2014 Championships - The Mediterranean Grand Prix - held in Ibiza Spain between the 5th-7th September Team Chaudron made an impressive start and now moves on to the next meeting as leader of Class One V1. This Class is reserved to prototype racing craft that, with a minimum length of 36ft and maximum of 43ft, using inboard motors only, can reach speeds in excess of over 100mph. Undoubtedly Round 2 of these Championship - The Grand Prix of Italy - is crucial for P1-55, the boat flying the Malta flag as a commendable repeat of Round 1 performance will give Team Chaudron valuable points to go to the final round of these Worlds - The U.A.E. Grand Prix in Abu Dhabi - with great confidence. Abu Dhabi hosts Round 3 on the 29/30 November. "The UIM ClassOne World Powerboat Championship is definitely the pinnacle of international offshore powerboat racing. Dominique and I are combining well and P1-55 is performing magnificently. Yet we are in competition with the best, whether it is crews or boats", remarked Aaron Ciantar. In the canopy cockpit of the 41-footer P1-55, Team Chaudron is made up of Aaron Ciantar in his traditional driver's role with French man Dominique Martini featuring as throttle-man. Aaron has won three World Championships on Chaudron boats, two in Europe - UIM Powerboat P1 World Championship 2008 and 2009 - and one in America - 31st Key West (USA) World Championship 2011. Furthermore Chaudron boats also featured as World Champions in the UIM Powerboat P1 World Championship 2007 and the 31st Key West (USA) World Championship 2011. Here the owners and crew of the winning boats were Italian and Ukraine respectively. The UIM ClassOne World Powerboat Championship is a dynamic and spectacular event with a exceptional promotion value through its global TV exposure. Televised by a number of high-profile broadcasters the like of CANEL+ (France), SKY (UK), VIASET (Scandinavia), CNTV (China), ABU DHABI TV (Middle East) and others which reaches millions of households with all the excitement, passion, charm and prestige the event, teams, host destinations and all involved experiences provided through their involvement in these Championships. All eyes will now be on the Italian town of Terracina where it will be happening and on Team Chaudron who will endeavor to ‘Take Two' and make it happen - again.